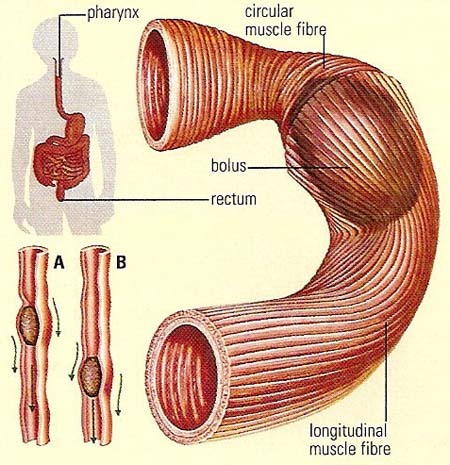 The walls of the GI tract have an inner, circular muscle fibre coat and an outer, longitudinal muscle fibre coat. As the ball of food (bolus) formed in the mouth enters the pharynx, a reflex action is initiated. This produces slow, wave-like contractions in the walls of the esophagus and later along the whole length of the tract. These peristaltic waves involve the contraction of the circular muscle fibres behind the bolus (A) and their relaxation in front of the bolus. Longitudinal muscles provide the wave-like action. The two functions together push the ball down the tract (B). Peristalsis is synchronized or coordinated contraction of the muscles that surround tubular organs. Waves of peristalsis, for example, propel food content through the gastrointestinal tract (GI tract) to facilitate normal digestion and the absorption of nutrients. Peristalsis is dependent upon the coordination between the muscles, nerves, and hormones in the GI tract. It is effected by the autonomic nervous system plexuses acting on visceral muscle layers. The reverse process, antiperistalsis, produces vomiting. Peristalsis also occurs in the ureter.